One of the things that characterizes our meetings throughout the summer here in Taizé is that we come from different Churches. Living together for a few days, God enables us to anticipate unity and to welcome one another in our diversity. The search for unity among Christians does not just concern theologians and Church leaders. More than ever, in order to advance towards unity, all of us, each of us can make a commitment to "live as people who are reconciled" in our daily existence. Living as people who are reconciled is not a static condition. It is an approach that sends us towards others, those who are different from us, not to oppose them, not to criticize them but to get to know them and to discover the Gospel treasures in which they root their lives. We are all on this journey towards reconciliation, but I would like to express tonight our special gratitude to Eastern Christians. Orthodox Christians come throughout the summer to spend a week on our hill, from Russia, Ukraine, Belarus, Romania, Serbia, and Greeks too. And there are Greek-Catholics among us. There are also those who belong to other Eastern Churches and who share with us the treasures of their faith and their traditions: Coptic Egyptians, Armenians, Jacobite and Malankar Indians. Last week Khulood, an Iraqi Chaldean Christian who lives with her family in Taizé, told us about the hardships her people are going through. Knowing that Christ gathers us from around the world is a wonderful encouragement to resist despair. Whereas sometimes, between East and West, misunderstandings can reign, which can open deep divisions and even lead to conflicts, together, Eastern and Western Christians, we can be salt of the earth, ferments of peace. Tonight I asked two Orthodox Christians to speak to us. Orthodox Christians, like Greek Catholics, place great emphasis on the centrality of the resurrection of Christ and also on the prominent role of the Holy Spirit in the Church. We can all receive from them this treasure of faith and prayer. Olga: The name "Vera" means "faith." And "Baba" means "Grandma." We called her Baba Vera because of her age. She had never had her own family; her young fiancé was killed in the camp. She herself spent eight years in prison, in the camp and in exile. And despite that she was one of the happiest people I have ever met. She was imprisoned because of her faith, like her brother and many other members of her parish. A priest lived secretly in the attic of her house, where he celebrated the liturgy. It was an underground church. Until she was arrested – her brother was already in prison – she lived with her elderly destitute mother and a paralyzed nursemaid. Her first thought was: this is impossible. God would not let this happen. And suddenly the last words of the priest shone with a dazzling light in her mind: Whatever happens, never despair, and never complain to God. "My soul became like a stone," she said, "I could not pray. And with my mouth I repeated – Slava Tebe Boze! – Just with my tongue, not with all my soul – in order to silence my heart." Marina: During this very difficult time, when we Ukrainians needed help, we did not lose hope or trust in God. Rather, our faith has been strengthened in our hearts. This winter at Maidan, we pitched a tent serving as a church where we gathered to pray all together. It was an important step for the union of Ukrainian Christians of different denominations. Every morning in central Maidan, we prayed to God for peace to return to our country. What do we find important in Taizé? Here in this island of peace where Christians from different countries come to pray and to live together, we can find peace of heart. 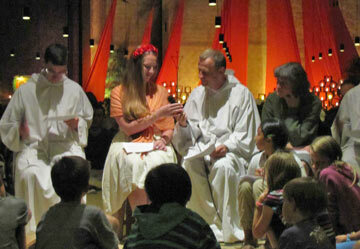 Taizé is the best place for us, Ukrainians and Russians, to overcome the conflicts, listen and understand one another. Brother Alois: Thanks to both of you, Olga and Marina. Be sure that we remain in communion with you. Tomorrow afternoon, we brothers will go off and leave you alone on the hill. You can surely understand that we need, once in the summer, to have some free time among ourselves. But we will all be together with you for evening prayer. Margaux will now say the names of the countries present this week and the children will give out flowers. At the same time we also send greetings from our heart to the young Africans gathered this week in Tlemcen, Algeria. They are having the same prayers and the same biblical reflections as we do here in Taizé. The distance does not separate our hearts and we want to tell our friends how close we feel to them. There are flowers for those from Korea, Japan, China, Macau, Hong Kong, Taiwan, Cambodia, Vietnam, Indonesia, Bangladesh, India, Iraq, Palestine, Lebanon and Armenia. For those from Russia, Finland, Sweden and Norway. For those from Belarus, Latvia, Lithuania, Poland, Germany, Netherlands, Belgium, Britain and Ireland. For those from Ukraine, Hungary, Austria, Czech Republic, Slovenia, Switzerland and France. For those from Albania, Romania, Serbia, Croatia, Bosnia and Herzegovina, Italy, Spain and Portugal. For those from New Zealand and Australia. For those from Chile, Argentina, Brazil, Bolivia, Colombia, Costa Rica, Guatemala, Puerto Rico, Dominican Republic, Haiti, Mexico, USA, Canada. And now, we will continue the prayer with singing, in particular for peace and reconciliation in Ukraine and in the Middle East, and in communion with the young people together in Algeria.